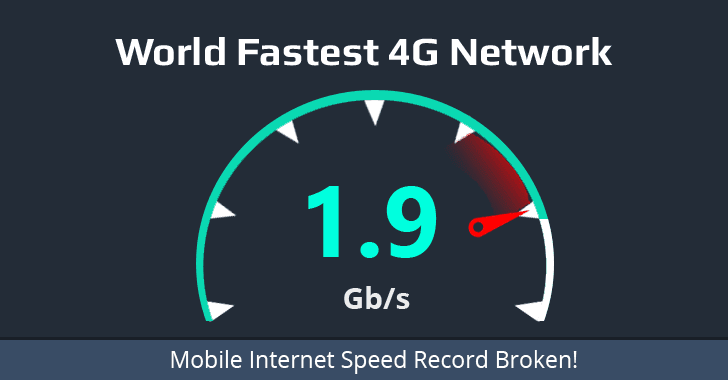 Elisa, one of the biggest Finnish Internet Service Providers (ISP), claims to have achieved a new world record for 4G network with 1.9 gigabit-per-second (Gbps) data download speed using Huawei technology. Currently, Sweden and the United Kingdom have been crowned as the top countries across the world when it comes to fastest mobile 3G and 4G speeds, but now Finland is also working hard to give them a tough competition. Elisa set this record-breaking benchmark with the help of technology provided by Chinese telecom giant Huawei that could allow real-world mobile 4G users to download a Blu-ray film in just 40-45 seconds. In February last year, a team of researchers from the University of Surrey managed to achieve a record-breaking speed of 1 Terabit per second (1Tbps) during a test of 5G wireless data connections, which is over 500 times faster than Elisa's 4G speed. While, in June last year, the International Telecommunication Union (ITU) decided that 5G compliant Internet providers will have to provide a standard data speed of up to 20Gbps, which is still 10 times faster than Elisa's 4G speed. But currently, the fastest available mobile 4G broadband subscription provides a speed of up to 300Mbps, while the maximum possible speed on a real-world Elisa's live network is 450Mbps. "The speeds that the 4G network offers are continuously increasing and, possibly in the next few years, we will even be able to offer mobile data connections of several gigabits per second to our customers," says Sami Komulainen, Vice President at Elisa. However, Elisa is not the first telecommunication company planning to offer at least 1 Gbps on 4G network within the next "two to three years," as VodaFone Germany has also prepared to provide 1 Gbps on its 4G network by the end of 2016. Do You Need Ultra-High Speed Mobile Internet? You might be thinking that why a mobile user needs an ultra-high speed internet connection? If higher speeds have the potential for a more connected world with the faster flow of information, then what's wrong in it? Hyper-fast network speeds will not only be a boon to virtual reality and augmented reality but also will accelerate the mobile video market, facilitating the streaming of larger files, like "high-quality 4K video and beyond." Moreover, in today's portable world, mobile customers also make use of their mobile Internet data on their laptops and desktops via tethering feature and higher speeds will improve their Internet experience.